Dry River is a band from the banks of the Santa Ana River in Southern California: Oliver Althoen (guitar/vocals), Dave Forrest (harmonica/occasional vocals), Joel Helin (bass, backing vocals) and Ruben Ordiano (drums). They play mostly acoustic, mostly original songs, mostly in the Folk/blues/Americana genres. 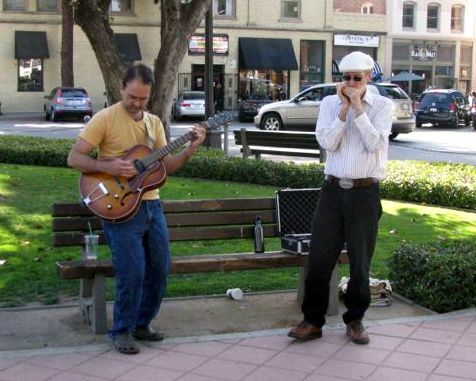 Oliver (a music teacher) and Dave (an engineer of some sort) founded the band as a guitar-harmonica duo on Sunday, May 26, 2013, with a two-hour acoustic busking session at the Orange Circle in Orange, California. The name “Dry River” refers to the Santa Ana River (which would be dry most of the time if it weren’t for reclaimed wastewater) is the geographic link between Orange County (where Oliver and his family lives) and the Inland Empire (where Dave and his wife live). Oliver and Dave played several shows as a duo in SoCal: Streamliner Lounge in Orange, Back to the Grind and the Mission Tobacco Lounge in Riverside, SaturationFest 2014 and 2015 in Riverside, and at several private events; and released a home-made album, Lost in the World, in 2013. Since then, Joel and Ruben have joined the band, and the four of them, with guest musicians, released a second album, Prayin’ for the Rain, in 2016.